Can you guess what the item in the picture is? It looks like a high end PC module but you may not find it in current PC architecture in the market. That is true, it is a DDR3 memory module that boost up the PC performance significantly. With current core processor’s number and speed increase, memory module could be the bottleneck that slows down the whole PC performance. And with the introduction of even faster DDR3 replacing older memory architecture of DDR2 and SDRAM modules, SuperTalent hopes to stay on top of the line among its competitors in memory products. The module, named as Project X, is currently one of the most advance and highest speed DDR3 module available in the market. There are two modules with speed of DDR3-1800 and DDR3-1600 that give consumers better choice for platform integration. The higher speed of DDR3-1800 has a latency specification of 7-6-6-18 whereas DDR3-1600 at 7-6-6-18 specification. Besides the high end technology being deployed, the module itself also comes with impressive aluminium heat sink outlook that helps to dissipate thermal heat effectively. As compared to DDR2 memory specification of 1.8V supply voltage, DDR3 features lower supply voltage of 1.5V that reduce the thermal heat and with such a nice passive cooling mechanism in place, even cooler enviroment the PC can operate in. Although it may not usable or compatible with all the current platforms that utilize DDR-2, those enthusiasts should be able to find their ways to utilize it in upcoming platform for higher performance applications. 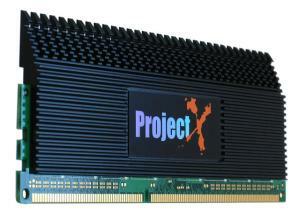 Both DDR3-1800 and DDR3-1600 will be available in commercial market by next week at $599 and $549 respectively.